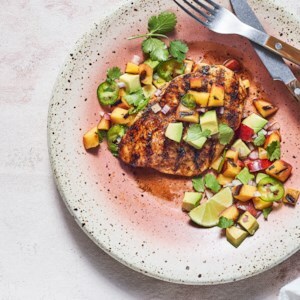 Find healthy, delicious BBQ and grilled chicken recipes, from the food and nutrition experts at EatingWell. 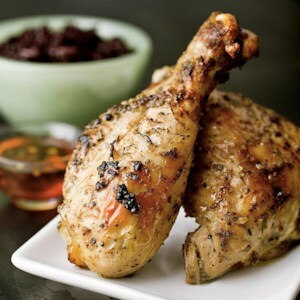 Based on a recipe of the Shakers, a Quaker splinter group from mid-19th century, this marinade derives its flavor from a hefty jolt of cider vinegar and lots of chopped shallots. 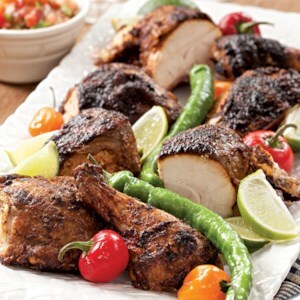 If you have ingredients like soy sauce, garlic powder, paprika, balsamic vinegar and garlic, you can throw together a flavorful rub or marinade in minutes. 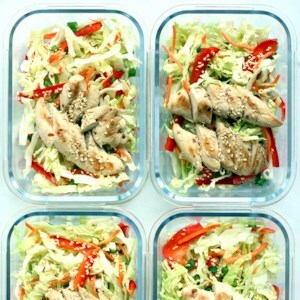 That's all you need to take chicken from flat to bodacious. 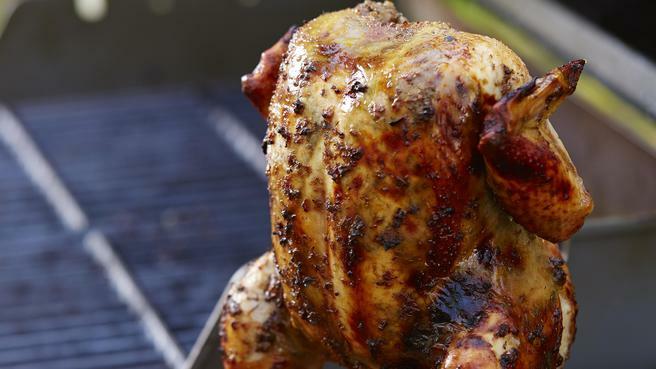 In this whole grilled chicken recipe, a vertical grilling rack allows the heat of the grill to flow inside the bird, which means it cooks from both the inside and outside. 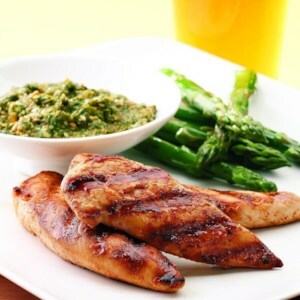 Cook chicken tenders quickly on the grill and top with pesto made with cilantro and sesame seeds for a zesty, speedy dinner. 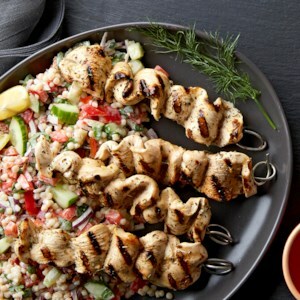 Serve with: Quinoa and grilled asparagus. 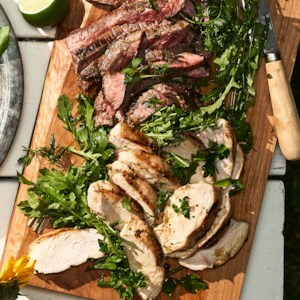 Fresh ideas for grilled chicken plus amazing recipes for brines, rubs, marinades, sauces and more. 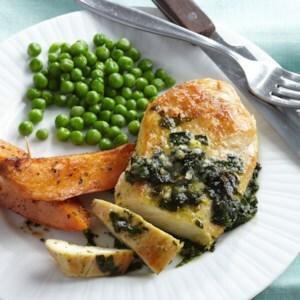 This grilled chicken has an Italian-inspired taste when topped with a freshly made pesto. 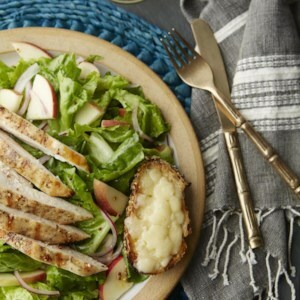 Serve it with fresh peas and roasted potato wedges for dinner, or over mixed salad greens for a hearty lunch salad. 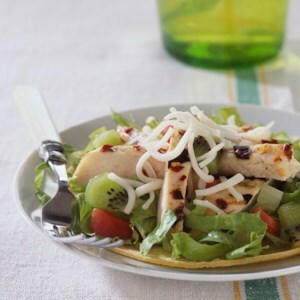 Cumin and red pepper spice up the grilled chicken in this fun tostada recipe. Kids will love the sweet kiwi topping. 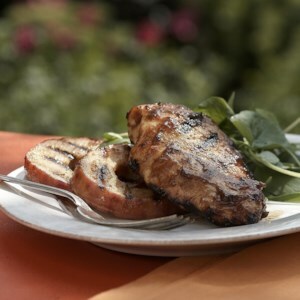 This hearty chicken recipe gets amazing flavor from an apple butter glaze and grilled apple rings. 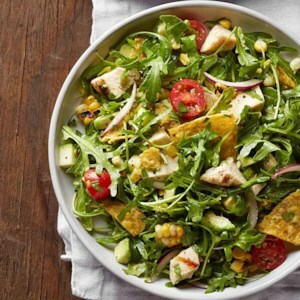 Sweet potatoes are a good source of fiber and vitamin A, and can be prepared in a variety of ways. 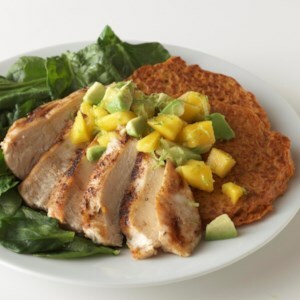 In this recipe, shredded sweet potatoes are formed into patties, cooked like pancakes, and served with jerk-seasoned chicken and a citrusy avocado-mango salsa. 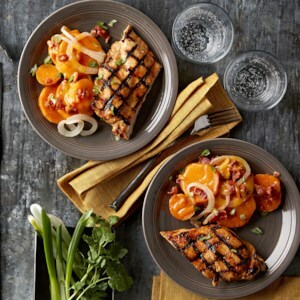 The sweetness in this Maple-Bourbon Chicken recipe is from the real maple syrup and grilled sweet potatoes. 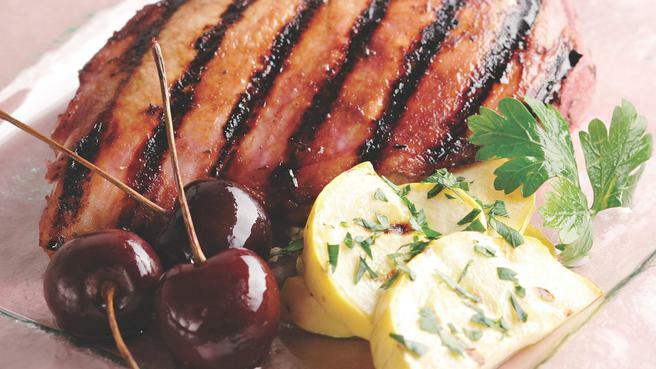 Bacon is also included! 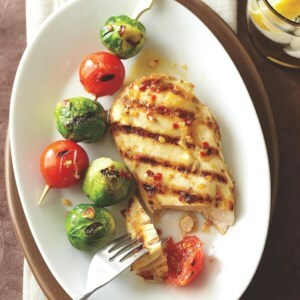 Marinate the chicken in fridge for a few hours before cooking to make sure the chicken is juicy, tender, and flavorful. 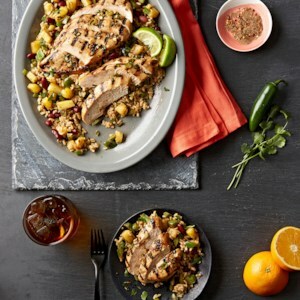 Serve over homemade zesty Caribbean Rice for a crowd-pleasing meal. 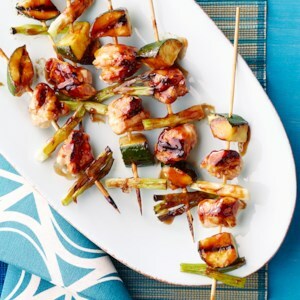 Thanks to a yogurt-based marinade, these chicken kabobs are especially tender. 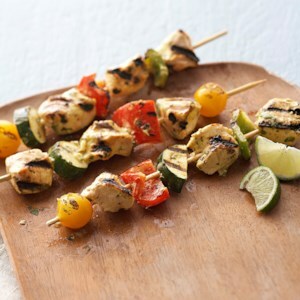 The curry powder lends a kick without too much heat, and to please the vegetarians at your table, you can simply grill the chicken and vegetables on separate skewers. 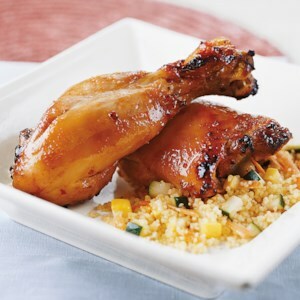 Serve this slow-grilled chicken dinner over fluffy couscous or saffron rice. 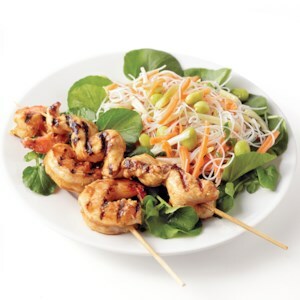 The chicken is low in calories and fat but rich in flavor. 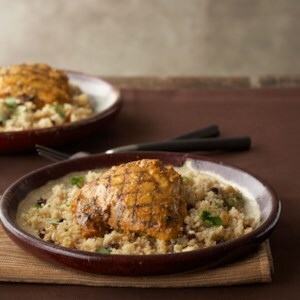 An easy side dish for this chicken is hot cooked couscous mixed with chopped zucchini and/or yellow summer squash and shredded carrot. 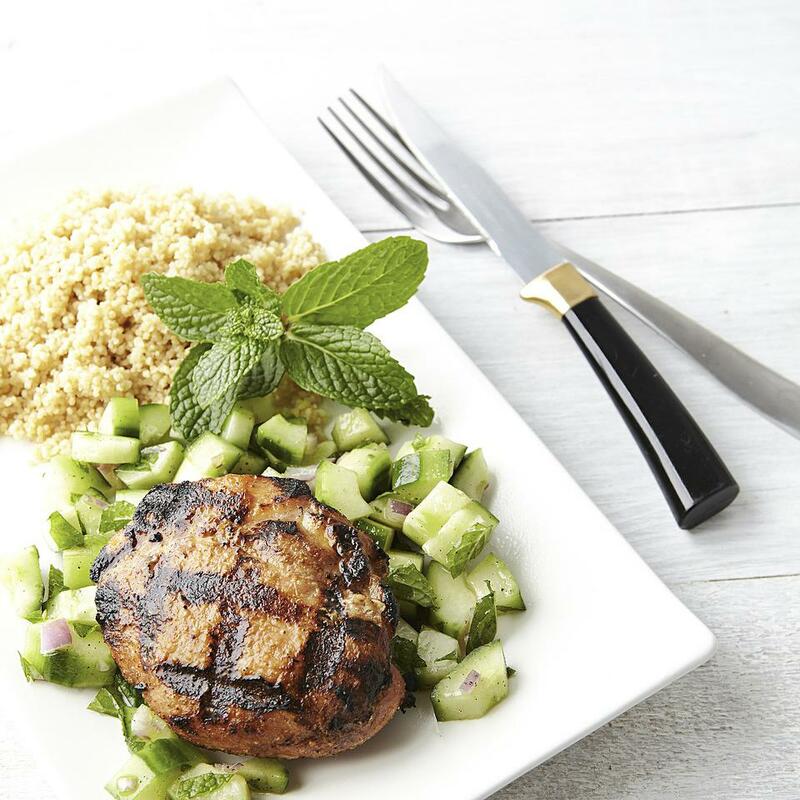 Remember to add the carbs for the couscous mixture to your daily carb count. 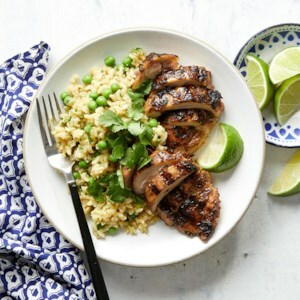 Chicken thighs are easy on the budget and great for grilling because they stay moist in the heat. 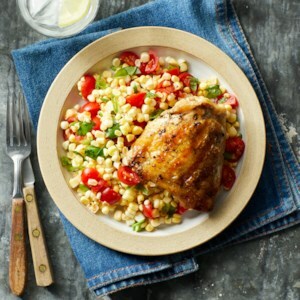 Here, they are paired with a fresh corn and tomato salad for a simple summer dinner. 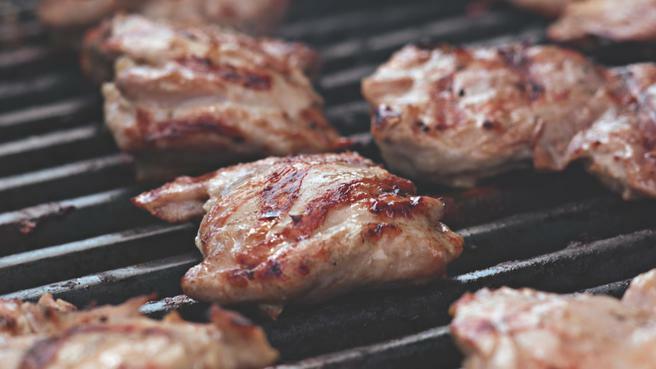 When grilling skin-on chicken thighs, watch for flare-ups. 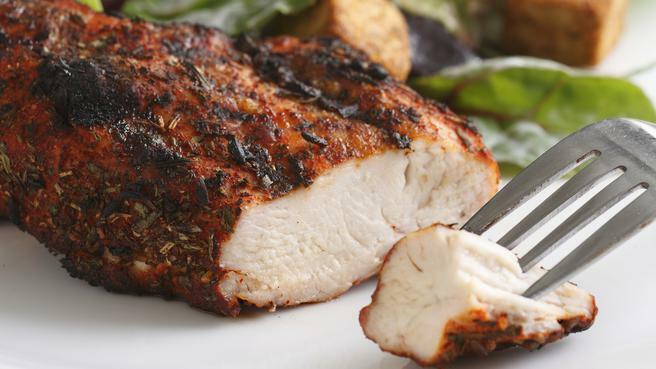 Move the chicken away from the flames and reduce heat, if necessary, to keep it from charring. 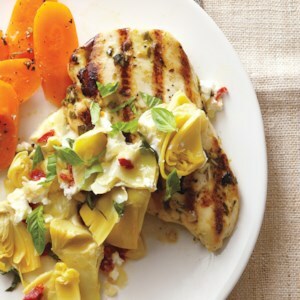 Chopped artichoke hearts, sun-dried tomatoes and goat cheese are a winning combination when served with this marinated, grilled chicken. 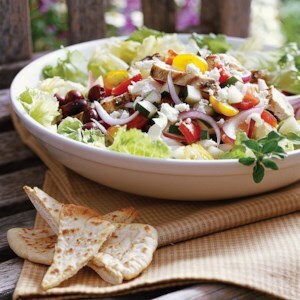 This Greek-inspired, main-dish chicken salad is enhanced with feta cheese, tomatoes and kalamata olives and served with a low-fat cucumber dressing.